Obituary for Myron Ness | Hanson & Dahl Funeral Home, Inc. 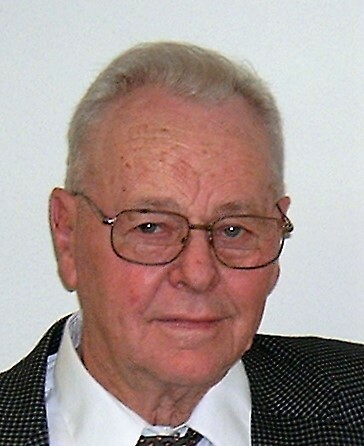 The funeral for Myron W. Ness of Dawson, longtime resident of Providence township, originally scheduled for this Saturday April 14 at 2:00 p.m. has been rescheduled due to the pending blizzard forecasted for this Friday evening and Saturday. The family does not want to endanger anyone’s health and safety. The new time is Sunday, April 15 at 3:00 p.m., at Dawson Covenant Church. The Rev. Erik Carlson will officiate and interment will be in the Dawson Covenant Cemetery. Visitation will be for one hour before the service. Myron Ness died Wednesday, March 21, 2018 at the Johnson Memorial Care Center in Dawson at the age of 93. Myron Wallace Ness was born in Dawson, on November 8, 1924 to August and Emma (Pederson) Ness of Providence Township. He graduated from 8th grade at District 38 “Windy Hill” and from Dawson High School. Although he had intended to attend Dunwoody Institute to pursue a career as a vocational arts instructor, the war was on, and his father secured a farm deferment for him instead. Myron met Lillian “Toots” Franklin in the late 40’s when her car needed repair by him. They roller skated and fished together, and he visited her in the hospital (and stayed to talk, not just peeking in the door) when she caught polio while she was a schoolteacher. They were married by her father, the Rev. Nath Franklin, on March 31, 1950 at the Dawson Covenant Church. Myron lived on the family farm all his life. He had dairy cattle until the 60’s, but once he caught the camping bug, the dairy days were numbered. He farmed mixed grains and had feeder cattle and pigs. At the age of 65, he dug a foundation and built an addition to the house to allow them to live there many more years. He was proud to see the designation of their farm as a Century Farm. Myron always loved handcrafts: milling woodwork, turning candlesticks, making side tables and furniture pieces, weaving rugs. He bought his girls power tools and sewing machines, and taught them to use all of them. He supported their goals, and made sure they had quality musical instruments. Myron also loved travel. He and Lillian visited every state and every province, and 20 countries; they made 16 trips to Alaska. They enjoyed camping with others, and also loved to visit daughters, siblings, nieces, nephews and friends during their sojourns. He was a loving father and caring uncle. He volunteered extensively for Dawson Covenant Church, KICY Radio in Nome and Bethel Alaska, Dawson Hospital board, and Dist 38 school board. He was preceded in death by his wife Lillian Ness; his parents; his brothers: Everett, Willie, Vernon and Lloyd Ness and their spouses; sons-in-law: Bob (Carol) Shackleton and Fritz (Carol) Skinner; and six of his nieces and nephews. He is survived by his daughters Kris (Mike) Cosentino of rural Dawson and Carol Skinner of Gothenburg, NE; 37 nieces and nephews and their families and many, many friends, almost all of whom have some piece of his woodworking or weaving in their homes and lives.